Interested in the most relevant soil articles of 2015? In this short series of posts I’ve compiled a list of the 30 most cited articles of the top ten journals in the category of SOIL SCIENCES. Today, the last post of the series is published: JOURNAL OF SOILS AND SEDIMENTS. Do you miss something? Post your comment. Abel, S., Nehls, T., Mekiffer, B., Wessolek, G. Heavy metals and benzo[a]pyrene in soils from construction and demolition rubble. 2015. Journal of Soils and Sediments, 15 (8), pp. 1771-1780. DOI: http://dx.doi.org/10.1007/s11368-014-0959-4. Arjmand Sajjadi, S., Mahmoodabadi, M. Sediment concentration and hydraulic characteristics of rain-induced overland flows in arid land soils. 2015. Journal of Soils and Sediments, 15 (3), pp. 710-721. DOI: http://dx.doi.org/10.1007/s11368-015-1072-z. Bai, R., Chen, X., He, J.-Z., Shen, J.-P., Zhang, L.-M. Candidatus Brocadia and Candidatus Kuenenia predominated in anammox bacterial community in selected Chinese paddy soils. 2015. Journal of Soils and Sediments, 15 (9), pp. 1977-1986. DOI: http://dx.doi.org/10.1007/s11368-015-1131-5. Baiamonte, G., De Pasquale, C., Marsala, V., Cimò, G., Alonzo, G., Crescimanno, G., Conte, P. Structure alteration of a sandy-clay soil by biochar amendments. 2015. Journal of Soils and Sediments, 15 (4), pp. 816-824. DOI: http://dx.doi.org/10.1007/s11368-014-0960-y. Capra, G.F., Ganga, A., Grilli, E., Vacca, S., Buondonno, A. A review on anthropogenic soils from a worldwide perspective. 2015. Journal of Soils and Sediments, 15 (7), pp. 1602-1618. DOI: http://dx.doi.org/10.1007/s11368-015-1110-x. De la Rosa, J.M., Martins, J.M., Soares, A.M., Araújo, M.F. Assessment of distribution and sources of pyrogenic carbon in the lower course of the Guadiana River (SW Iberian Peninsula). 2015. Journal of Soils and Sediments, 15 (4), pp. 759-768. DOI: http://dx.doi.org/10.1007/s11368-015-1092-8. Egli, M., Lessovaia, S.N., Chistyakov, K., Inozemzev, S., Polekhovsky, Y., Ganyushkin, D. Microclimate affects soil chemical and mineralogical properties of cold alpine soils of the Altai Mountains (Russia). 2015. Journal of Soils and Sediments, 15 (6), pp. 1420-1436. DOI: http://dx.doi.org/10.1007/s11368-013-0838-4. Elkhatib, E.A., Moharem, M.L. Immobilization of copper, lead, and nickel in two arid soils amended with biosolids: effect of drinking water treatment residuals. 2015. Journal of Soils and Sediments, 15 (9), pp. 1937-1946. DOI: http://dx.doi.org/10.1007/s11368-015-1127-1. Fu, B., Zhang, L., Xu, Z., Zhao, Y., Wei, Y., Skinner, D. Ecosystem services in changing land use. 2015. Journal of Soils and Sediments, 15 (4), pp. 833-843. DOI: http://dx.doi.org/10.1007/s11368-015-1082-x. Greinert, A. The heterogeneity of urban soils in the light of their properties. 2015. Journal of Soils and Sediments, 15 (8), pp. 1725-1737. DOI: http://dx.doi.org/10.1007/s11368-014-1054-6. Guo, X.-J., Zhu, N.-M., Chen, L., Yuan, D.-H., He, L.-S. Characterizing the fluorescent properties and copper complexation of dissolved organic matter in saline-alkali soils using fluorescence excitation-emission matrix and parallel factor analysis. 2015. Journal of Soils and Sediments, 15 (7), pp. 1473-1482. DOI: http://dx.doi.org/10.1007/s11368-015-1113-7. Jan, J., Borovec, J., Kopáček, J., Hejzlar, J. Assessment of phosphorus associated with Fe and Al (hydr)oxides in sediments and soils. 2015. Journal of Soils and Sediments, 15 (7), pp. 1620-1629. DOI: http://dx.doi.org/10.1007/s11368-015-1119-1. Jia, Y., Bao, P., Zhu, Y.-G. Arsenic bioavailability to rice plant in paddy soil: influence of microbial sulfate reduction. 2015. Journal of Soils and Sediments, 15 (9), pp. 1960-1967. https://www.scopus.com/inward/record.uri?eid=2-s2.0-84939472733&partnerID=40&md5=f51a7191ac73810c3cf306202947446b DOI: http://dx.doi.org/10.1007/s11368-015-1133-3. Kelepertzis, E., Paraskevopoulou, V., Argyraki, A., Fligos, G., Chalkiadaki, O. Evaluation of single extraction procedures for the assessment of heavy metal extractability in citrus agricultural soil of a typical Mediterranean environment (Argolida, Greece). 2015. Journal of Soils and Sediments, 15 (11), pp. 2265-2275. DOI: http://dx.doi.org/10.1007/s11368-015-1163-x. Łukasik, A., Szuszkiewicz, M., Magiera, T. Impact of artifacts on topsoil magnetic susceptibility enhancement in urban parks of the Upper Silesian conurbation datasets. 2015. 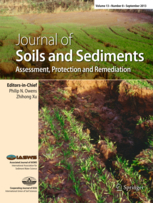 Journal of Soils and Sediments, 15 (8), pp. 1836-1846. DOI: http://dx.doi.org/10.1007/s11368-014-0966-5. Ma, L., Rao, X., Lu, P., Huang, S., Chen, X., Xu, Z., Xie, J. Acid-tolerant plant species screened for rehabilitating acid mine drainage sites. 2015. Journal of Soils and Sediments, 15 (5), pp. 1104-1112. DOI: http://dx.doi.org/10.1007/s11368-015-1128-0. Peng, H., Horton, R., Lei, T., Dai, Z., Wang, X. A modified method for estimating fine and coarse fractal dimensions of soil particle size distributions based on laser diffraction analysis. 2015. Journal of Soils and Sediments, 15 (4), pp. 937-948. DOI: http://dx.doi.org/10.1007/s11368-014-1044-8. Perri, F., Scarciglia, F., Apollaro, C., Marini, L. Characterization of granitoid profiles in the Sila Massif (Calabria, southern Italy) and reconstruction of weathering processes by mineralogy, chemistry, and reaction path modeling. 2015. Journal of Soils and Sediments, 15 (6), pp. 1351-1372. DOI: http://dx.doi.org/10.1007/s11368-014-0856-x. Qian, L., Chen, M., Chen, B. Competitive adsorption of cadmium and aluminum onto fresh and oxidized biochars during aging processes. 2015. Journal of Soils and Sediments, 15 (5), pp. 1130-1138. DOI: http://dx.doi.org/10.1007/s11368-015-1073-y. Sass, O., Kloss, S. Distribution of macro charcoal from forest fires in shallow soils of the Northern Alps. 2015. Journal of Soils and Sediments, 15 (4), pp. 748-758. DOI: http://dx.doi.org/10.1007/s11368-014-0954-9. Sauer, D., Stein, C., Glatzel, S., Kühn, J., Zarei, M., Stahr, K. Duricrusts in soils of the Alentejo (southern Portugal)—types, distribution, genesis and time of their formation. 2015. Journal of Soils and Sediments, 15 (6), pp. 1437-1453. DOI: http://dx.doi.org/10.1007/s11368-015-1066-x. Vácha, R., Skála, J., Čechmánková, J., Horváthová, V., Hladík, J. Toxic elements and persistent organic pollutants derived from industrial emissions in agricultural soils of the Northern Czech Republic. 2015. Journal of Soils and Sediments, 15 (8), pp. 1813-1824. DOI: http://dx.doi.org/10.1007/s11368-015-1120-8. Wang, C., Zhu, L., Zhang, C. A new speciation scheme of soil polycyclic aromatic hydrocarbons for risk assessment. 2015. Journal of Soils and Sediments, 15 (5), pp. 1139-1149. DOI: http://dx.doi.org/10.1007/s11368-015-1083-9. Wang, H., Su, J., Zheng, T., Yang, X. Insights into the role of plant on ammonia-oxidizing bacteria and archaea in the mangrove ecosystem. 2015. Journal of Soils and Sediments, 15 (5), pp. 1212-1223. DOI: http://dx.doi.org/10.1007/s11368-015-1074-x. Wang, H., Zhu, J., Fu, Q., Hu, H. Adsorption of phosphate on pure and humic acid-coated ferrihydrite. 2015. Journal of Soils and Sediments, 15 (7), pp. 1500-1509. DOI: http://dx.doi.org/10.1007/s11368-015-1095-5. Wang, J.-T., Zheng, Y.-M., Hu, H.-W., Zhang, L.-M., Li, J., He, J.-Z. Soil pH determines the alpha diversity but not beta diversity of soil fungal community along altitude in a typical Tibetan forest ecosystem. 2015. Journal of Soils and Sediments, 15 (5), pp. 1224-1232. DOI: http://dx.doi.org/10.1007/s11368-015-1070-1. Wang, Q.-Y., Liu, J.-S., Wang, Y., Yu, H.-W. Accumulations of copper in apple orchard soils: distribution and availability in soil aggregate fractions. 2015. Journal of Soils and Sediments, 15 (5), pp. 1075-1082. DOI: http://dx.doi.org/10.1007/s11368-015-1065-y. Wang, X., Liang, C.-H., Yin, Y. Distribution and transformation of cadmium formations amended with serpentine and lime in contaminated meadow soil. 2015. Journal of Soils and Sediments, 15 (7), pp. 1531-1537. DOI: http://dx.doi.org/10.1007/s11368-015-1105-7. Wilkinson, S.N., Olley, J.M., Furuichi, T., Burton, J., Kinsey-Henderson, A.E. Sediment source tracing with stratified sampling and weightings based on spatial gradients in soil erosion. 2015. Journal of Soils and Sediments, 15 (10), pp. 2038-2051. DOI: http://dx.doi.org/10.1007/s11368-015-1134-2. Zhang, W., Zheng, J., Zheng, P., Tsang, D.C.W., Qiu, R. The roles of humic substances in the interactions of phenanthrene and heavy metals on the bentonite surface. 2015. Journal of Soils and Sediments, 15 (7), pp. 1463-1472. DOI: http://dx.doi.org/10.1007/s11368-015-1112-8.